A brand new trailer for Missing Link has arrived online. When last we heard from Laika, the celebrated animation studio behind Coraline, Corpse Bride and The Boxtrolls, they gave us Kubo and the Two Strings. While that movie was perhaps criminally underseen, those who did take it in understood the amazing visuals, imaginative world and various joys it had to offer. Now, they're back with another ambitious offering that pairs Hugh Jackman with Zach Galifianakis for a new take on the old Bigfoot legend. The trailer kicks off by quickly covering the history of this legendary creature and the various names he's gone by over the years. We quickly come to realize that Bigfoot, or Mr. Link (Zach Galifianakis), is a normal guy who just wants to see the world. So, he buddies up with a legendary adventurer (Hugh Jackman) to show him more of the world and to help him find his cousins, also known as the Yeti. It then turns into a series of mishaps and misadventures as the two try to make their way through the human world while trying to make Bigfoot blend in. Much of it is charming and all of it, as per usual with Laika, is visually incredible. Missing Link, appropriately centers on Mr. Link. He's 8 feet tall, 630 lbs, and covered in fur, but despite his appearance, he is funny, sweet and very literal, making him the world's most lovable legend, who goes by the name of Susan. Tired of living a life of solitude in the Pacific Northwest, Mr. Link, aka Susan, recruits renowned explorer Sir Lionel Frost to guide him on a quest to locate his long-lost relatives in Shangri-La. They're joined by adventurer Adelina Fortnight, voiced by Guardians of the Galaxy star Zoe Saldana, and the trio encounters more than they bargained for in the way of danger as they make their way to the far reaches of the Earth to help Mr. Link. Along with Hugh Jackman and Zach Galifianakis, the all-star cast also includes Timothy Olyphant, David Walliams, Emma Thompson, Matt Lucas, Ching Valdes-Aran, Stephen Fry, and Amrita Acharia. Chris Butler serves as writer and director. He previously helmed ParaNorman for the studio. Travis Knight, who most recently helmed Bumblebee and previously directed Kubo and the Two Strings, is on board as a producer alongside Laika's head of production, Arianne Sutner. 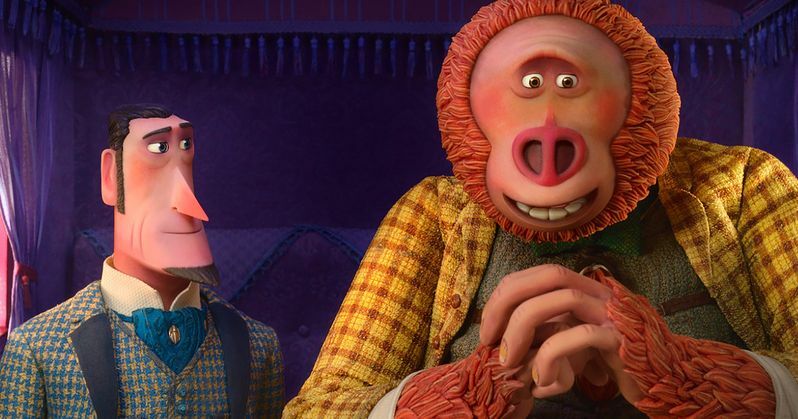 Missing Link is set to hit theaters on April 12. On that date, it opens up against the adaptation of the novel After, as well as the biblical tale Mary Magdalene, which stars Joaquin Phoenix and Rooney Mara in the title role. On that weekend specifically, it should work as a nice bit of counterprogramming, but it's opening up just a week after DC's latest Shazam, which should have a solid holdover. Overall, that could make it a competitive frame at the box office. Be sure to check out the new trailer from the Annapurna Pictures YouTube channel below.